Pinterest is one of the hottest new social sites of 2012, and developers haven’t wasted any time developing creative apps to enhance the experience. We hear about it everywhere and chances are you have spent some time pinning images and browsing popular boards already. As for me, I’m a bit of a Pinterest addict with more than 100 boards myself. I’ve tried all the apps and tools I can find to make this site even more fun and I’m sharing them all with you today. Most users will opt to install a plugin for Chrome that will allow you to send images straight to your Pin Boards without any extra hassle. The Google Chrome Webstore has a ton of Pinterest apps available, each with its own unique features and capabilities. Pinterest Pro adds pinning capabilities, as well as several unique functions such as instant zoom and a popular pin drop down. Pinterest Right Click adds the option to pin an image to your right click menu. Pin Search allows you to perform a Google Image search on any pinned image. There is a plethora of plugins to try, but you’ll need Google Chrome to access the best browser enabled apps. Pinterest itself was developed with a next generation browser in mind, so I recommend using Chrome for browsing Pinterest anyway. Since Pinterest was released, there are now many web-based apps to help you get the most Pinteresting experience possible. Here are some to consider. You can sign up with Pinterest with Facebook and connect your accounts and you can add your Facebook friends who are on Pinterest with ease. This also allows your pins to be shared on Facebook. You can gain new followers this way and also increase the reach to your pins. If Facebook users like your pins, they may head over to Facebook to like or repin them. Integrating Pinterest with your existing Facebook presence is a great way to jumpstart your Pinterest campaign. PinReach gives you stats and analytics for Pinterest. PinReach (formerly PinClout) is similar to Google Analytics or FB Insights, only for your Pinterest. You can monitor trends on the social networking site, see your success on the site and what people are looking at on your boards. It’s quick and easy to sign up and you can do so with your Twitter or Facebook account to make it even faster. Then enter your exact Pinterest username and your email to complete your account. Proper analytics software is a must if you plan on integrating Pinterest with your existing digital marketing campaign. Then you can also search the other tabs for Boards (far reaching boards) , Pins (most popular pins), and Influential Followers. 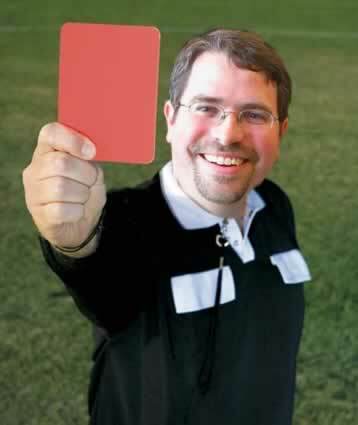 You will also be given a PinReach (PR) score for your account. 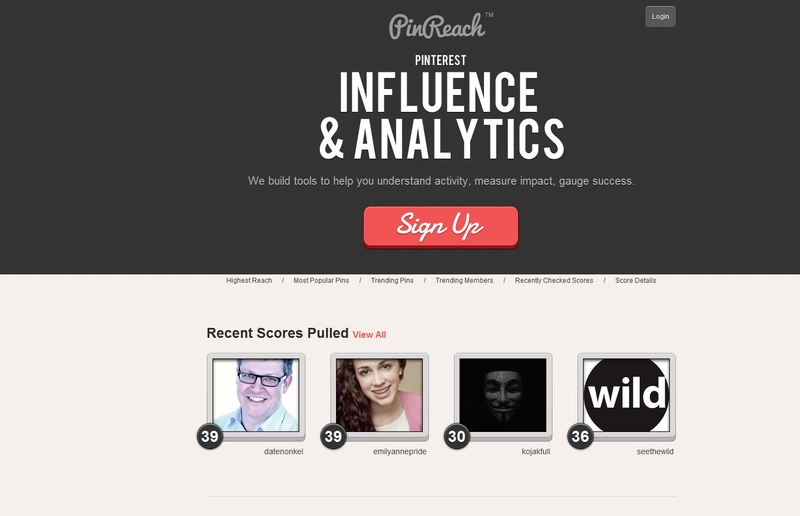 You can search the site for other PinReach users and their PR scores. You can also share with other social media networks with the easy share buttons. These make up your total Pinfluence Score. Users can follow you from here and you can share your Pinfluence Score and profile with other social networks. You can also use the site to search for other users in certain categories or to find a random user. 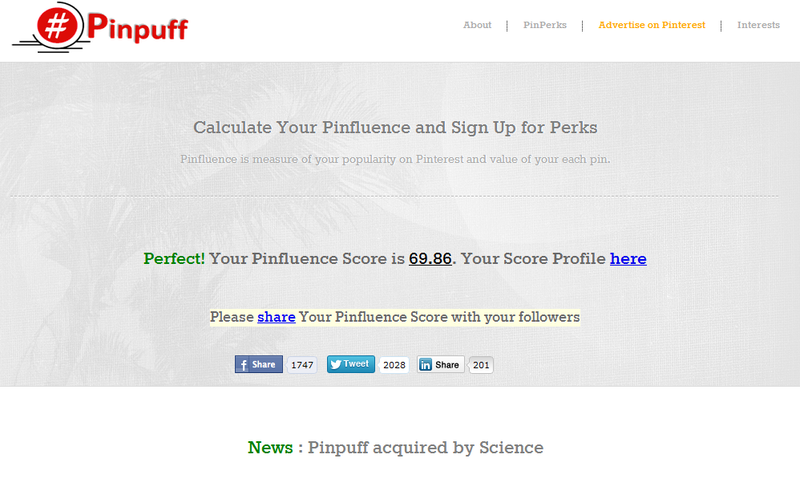 Your PinPuff score is similar to the Klout scoring system. This tool offers a quick reference to gauge the value of other users. Like Klout, it’s important not to take a score for granted; influence is relative and you never know when the accuracy is significantly off. A new addition to the site is PinPerks, which works like Klout Perks. PinPerks are exclusive gifts, invites, subscriptions or goodies that you earn based on your influence on Pinterest. You must have a Pinpuff account (its free) to participate and get rewarded for your pinfluence. ShareAsImage (formerly PinAQuote) is a great bookmarklet for anyone who loves sharing quotes online to their networks. 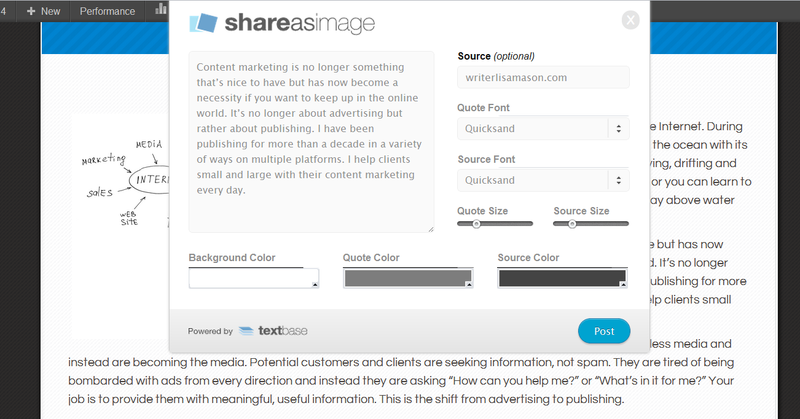 Share As Image lets you highlight text anywhere on the web and easily convert it into an image. With the PRO version you can choose fonts, colors and text size! 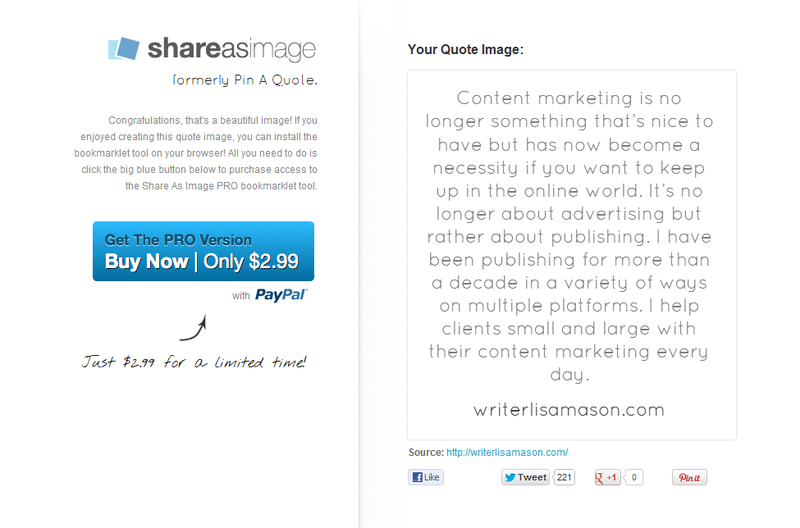 Once you’ve created your quote image, you can share it on Pinterest, Facebook or Twitter! (via their website). There is a free version or you can upgrade to Pro for only $2.99. Share as image makes it easy to convert any interesting block of text into an image you can add to your Pin Boards. Pinterest isn’t just for photos any more. This tool is really cool and easy to use. You just drag the bookmarklet to your toolbar and then when you are on any website where you want to share the quote, just highlight the text and click on the bookmarklet. You will then get a pop-up that allows you to choose what your quote will look like. The interface is simple, yet functional. You can select the font type and preview your image before saving. You can select the source (always nice to credit where credit is due), the font, the background color, font color and source color. To get the colors and cool features of this app, you need to pay for the Pro version but at only $2.99, it’s definitely worth it. SpinPicks is a really cool website that lets you browse the web for pictures to share on your Pinterest to any board you choose (you can also create new boards for them to fit in). Images are pulled from Flicker’s Creative Commons database, Instagram, Twitpic, Reddit/R, YouTube, and PicPlz so you can find great images that you have permission to use. SpinPicks allows you to quickly browse images that are licensed under Creative Commons Share Alike, adding variety to your boards and limiting your legal liability. SpinPicks “doesn’t pull spins from Google.com, Tumblr.com, Bing.com, and Facebook.com to help reduce the number of improperly attributed images, which helps ensure you’re only adding quality pins to your Pinterest collection,” via the SpinPicks website. I can verify this in the time that I have used it as well. Pinerly is like Tumblr for Pinterest. It’s still in closed beta right now, but you can enter your email address to go on the wait list. I’ve been trying it out for a couple of months and it’s pretty interesting. It gives you a clear shot of what is posted and where. You can also see other Pinners from your area, unfollow groups at one time and keep your Pinterest stream as focused and minimalized as you wish. It will even let you schedule pins throughout the day (so you get a steady stream of pins instead of a splurge in the one hour that you’re addictively pinning stuff) and you also get Pin Stats that tell you how specific pins are doing. Pinerly is touted as a management tool for your Pinterest account. The interface is easier to track for users who want a more traditional layout. Email app-maker WiseStamp is the developer behind the useful Pinterest Email App so I knew I had to try this one right away. I love WiseStamp and I’ve been using it for years. I happily donate since they offer this email app for free and it is the best signature app I have ever used. I know many people who have told me they followed me to Pinterest because of the link in my signature (thanks to WiseStamp). I love to share websites on Pinterest and I know I cannot be the only person who does this. I have boards for my articles, boards for interesting social media articles, boards for sports, boards for movie reviews and more. So this handy too, Snapito! makes it easy to pin websites by capturing a full screen shot of any website. 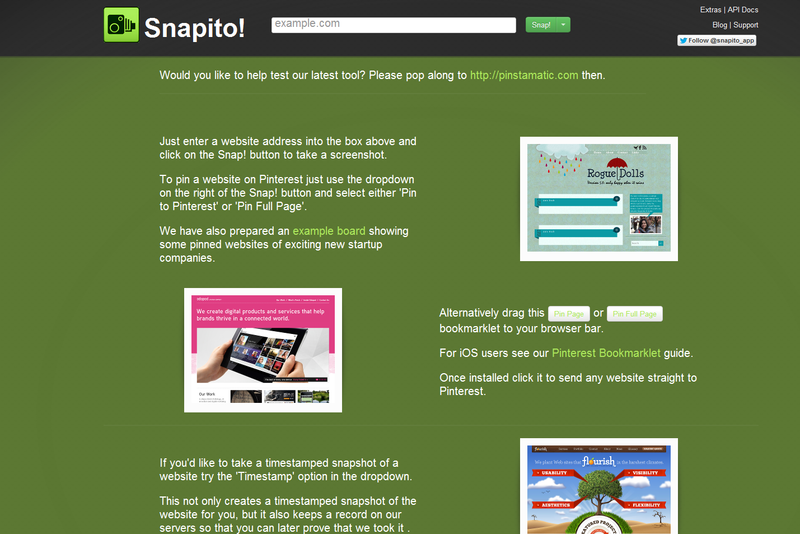 Snapito makes pinning websites to your boards without associating an image that isn’t quite related to a given link. Have you seen people create multiple boards in a row to design a spliced image that looks like one large image in your boards, then there is now a tool that makes it easy to do this without Photoshop. Right now, it’s not open to the public and you have to enter your email to get on the list. It’s definitely worth checking it out. 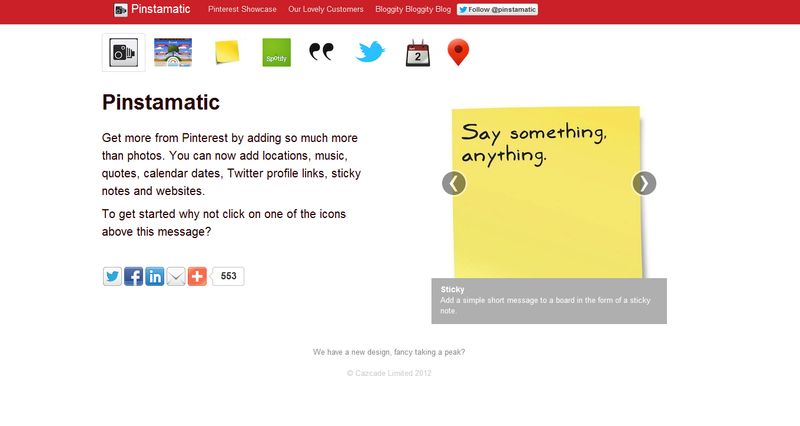 If you want to be able to submit more than just pictures to your Pinterest boards, then Pinstamatic is right for you. You can now add locations, music, quotes, calendar dates, Twitter profile links, sticky notes and websites. This is really cool and super easy to use. You can put the URL of any website and it will pull a snapshot and allow you to pin it. Some images are much more complete when you add a little something extra. Attach a song to a picture of a band, a calendar date to a wedding invitation, a link to your Twitter profile on a picture of yourself, and a location on scenic photos from around the world. You can create your own sticky notes with any message you want to type in and share it with just a click and you can even add Spotify music and more. I really like the look of the site and the ease of use. One of my favorite features is pinning Twitter profiles. SpinPicks on Your Phone- Android users can get SpinPicks on Google Play for free. It works the same way as SpinPicks web app described above. Turn Your Pins into a Puzzle- iTunes users have a cool app that lets you turn your pins into a puzzle that you have to solve on your phone. PinPuzzle is free to use, lets you pull from your boards or any public boards and create a level based game out of it. This one’s really addictive while you’re waiting around with nothing better to do. Pinspiration is available as a free download for Windows phones. So now Windows phone users can do everything that iPhone users can with Pinterest on their phone. Pin It On Pinterest (WordPress)– This one puts a Pin It button at the end of your posts and lets the user chose what will get pinned. Pinterest Pinboard Widget (WordPress) – I use this one on my website and I really like it. 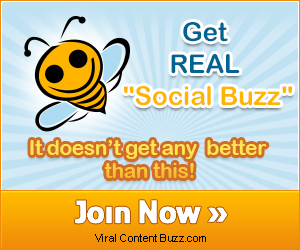 I also get new follows from people who visit my website thanks to this little plugin. Pinterest RSS Widget (WordPress)- This one lets you put your Pinterest in a widget on your sidebar. Very easy to use with most themes. You can set the height and width so it fits accordingly. Pretty Pinterest Pins (WordPress)- This one allows you to display thumbnail links to your own, or anyone’s, latest pins in your sidebar. Pinterest “Pin It” Button (WordPress)- One of the most popular Pin It buttons for WordPress sites. 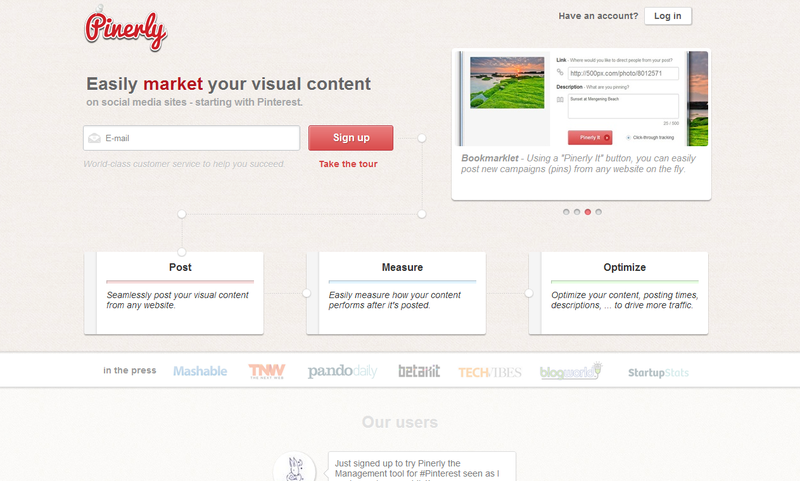 It’s a simple, clean button that asks people to share your content on Pinterest. Pinterest Follow Me (WordPress)- This one is an important one because many of the plugins only allow people to pin your content but they don’t apply the “follow me” feature so you get more followers on your profile. 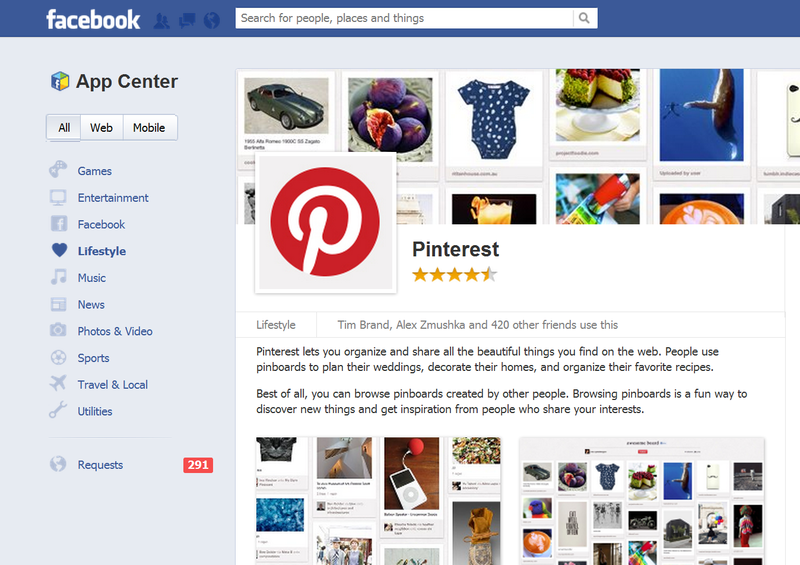 As you can see developers have been hard at work integrating Pinterest into everything from browsers to blogs. There is no shortage of Pinterest applications, and more are being developed every day. Do you have any cool Pinterest tools we didn’t mention here? 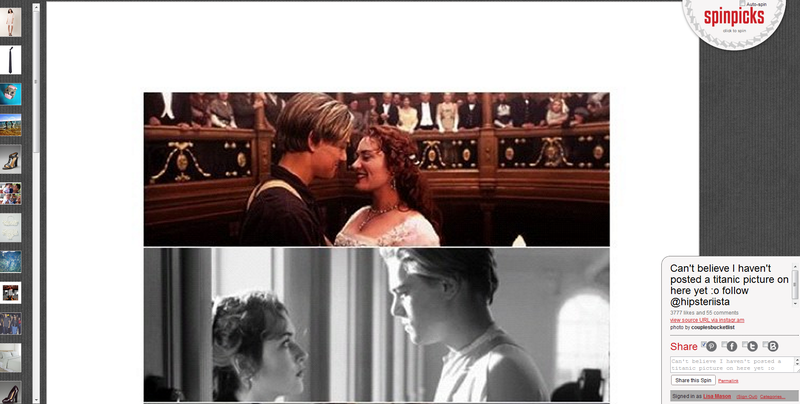 Which ones are your favorites? I love Pinterest, I think it is the freshest, most unique thing out there right now. Thanks Jason. Me, too. I’m having a lot of fun with it and also finding it beneficial from a business sense. lol I remember that you were one of the first people I recommended Pinterest to Jason! (I thought your Wig site could benefit), I think that what it has become, the type of content that is getting showcased is vetted really well right now. It can’t just be helpful, it has to be interesting. Pretty bad when I get caught up reading articles about different types of homemade play-doh and hanging flower gardens! I’ve just started playing with pinterest very helpful information. Lisa – Great article. I will be checking a lot of these Apps. Thanks. Your friends (well just one friend) at http://www.uniquegiftsanddecor.com.